Comments: Deciduous conifer native to the southeastern US. Trees can grow in shallow fresh water or swampy ground. 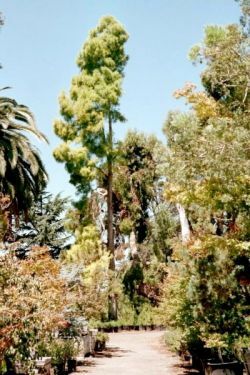 80' to 100' tall and a spread of 30', this tree has light green foliage in Spring, dark green in Summer, brown in Fall and bare (bald) in the Winter. Bald Cypresses can be planted in shallow water, or on wet ground. Conical in youth, but develops flat top when it reaches its max height at maturity. This tree is a bright yellow-green and is easily seen from Niles Blvd.